Dancing in the office, wearing costumes to work, and a flat organizational structure? What is this, Google? No, these are part of the unique workplace culture at one of the Rockford area’s biggest software design firms. 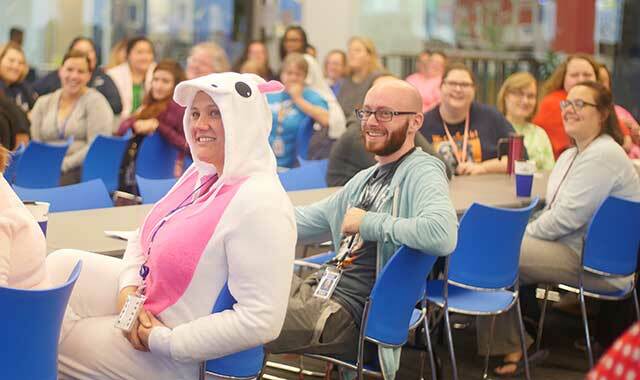 Ann Cline and Thomas Pickering attend a meeting during Spirit Week, during which employees dressed in pajamas and themed outfits. When the music starts playing, it’s time to dance. It doesn’t matter what you’re doing at your desk, your colleagues encourage you to join in – maybe for the Biker Shuffle or the Macarena. It’s like a birthday jingle at Texas Roadhouse – except this isn’t a restaurant. It’s the busy office of Practice Velocity, 8777 Velocity Dr., Machesney Park, Ill., one of the largest software firms in the Rockford area. Around 2:30 p.m. on a Friday, the company concierge rouses the troops as music blasts from the overhead speakers. Everybody in this open-concept office begins stepping, clapping and laughing as they share a line dance. Dancing at your desk is one of many unique quirks at Practice Velocity, a company whose culture is far more in tune with the Googleplex than the Midwest cubicle farm. This pioneering enterprise is attracting highly skilled jobs to the region and infusing the area’s workforce with a decidedly 21st-century skillset. Stern has 230 employees right now and sees ample opportunity for growth in coming months. It’s good news for Rockford’s small, but growing, software industry. Stern’s venture into the software business began as many enterprises do: he needed a product that didn’t exist. In the early 2000s, he was one of three partner doctors at Physicians Immediate Care, then a Rockford-based chain of urgent care centers. He and his partners wanted to find an electronic medical records (EMR) software program that could help them easily track patient care. But nothing on the market quite suited their needs. But he couldn’t escape a good idea. In 2002, Stern, partners John Koehler and Terry Buzzard, and some software engineers, began working in the basement of a Physicians Immediate Care clinic. Although it was Stern’s first foray into software, he brought a wealth of expertise in the urgent care business. The team’s first product, launched in 2002 and implemented at Physicians Immediate Care that year, was designed as an add-on to existing technology. What’s now the core of Practice Velocity’s business is a pair of original software products: PV Billing, released in 2007, which provides billing and revenue management services, and VelociDoc, released in 2009, an EMR software which allows physicians to document the patient’s care from entry to discharge. Customized for urgent care centers, Practice Velocity serves clinics in all 50 states through software accessed online. The firm does have competitors in this space, but it’s continuously ranked at the top. KLAS Research has ranked it as a top EMR software since 2012. Black Book named it tops from 2011 to 2015, while Medical Economics ranked it in the Top 50 in its latest survey. Looking around the Practice Velocity office, you quickly feel like you’re standing in Silicon Valley. The completely open office space is filled with pods of desks, with dividers rising to a seated employee’s eye level. Bright reds, greens and blues abound. Near the entrance, a Rockford Roasting Co. barista serves coffee at half-price, with Practice Velocity subsidizing the remaining cost. Nearby, four conference rooms allow employees to meet at standing conference tables, individual desks or a roundtable. In one room, team members lounging on couches are conferencing with a woman seated on a balance ball. It’s “Team Fanatic Friday,” the closing day of the company’s Spirit Week, and employees are sporting their jerseys and hoodies. Stern is wearing a soccer jersey. You’d never guess this space used to be a Kohl’s department store at the Machesney Park Mall. In 2014, Practice Velocity invested $8 million into converting the 63,000 square-foot space into a high-tech office, complete with windows and skylights that fill the workplace with natural light. The design of this space helps to reinforce the company’s unique culture, in which cohesive teams and meaningful work are valued. The team at Practice Velocity embraces four core values: team player, positive energy, continuous improvement and clients win. Teamwork is essential to the company’s flat organizational structure, which has eliminated most hierarchies. Employees work in teams of about eight to 12 people, all huddled together in pods. Alan Ayers, the company’s vice president of strategy, is one of many company executives who is stationed in a pod with his team. Employees hold each other and the company accountable in several ways. Teams begin each morning with standup, a discussion of what was accomplished the day before and what needs to be accomplished today. Transparency is an important component, since the company launched open-book management this year. On Tuesday mornings, the crew assembles in the Town Hall center for a huddle in which financial information is shared. Metrics play an important role, but Stern is also quick to celebrate small successes and identify the stories behind the metrics. Stern rewards his team in many ways, constantly reinforcing the company culture while doing so. On Wednesdays, employees enjoy a free lunch. One Friday each month, employees stay late for a “TGIF” company party. The recent Spirit Week ended with a chili cook-off and barbecue. Realizing this unique company culture was no small feat. When Stern reorganized the company into a team structure, not everyone was on board, he says. Some left the company, but once the approach took hold, the company found incredible efficiencies. For now, Practice Velocity isn’t designing new software, but it is enhancing its current products. Through small changes, the company is able to address customer needs and adapt to industry changes. Before Ayers joined Practice Velocity in 2015, he spent a decade managing urgent care centers around the country. Both he and Stern have served on the board of the Urgent Care Association of America, a trade group that Stern helped to launch. They both maintain dialogue with clients and industry leaders. “We’re very responsive to our clients’ day-to-day operational needs, and many of our clients rely on us to help them understand where the industry is headed and where their businesses should be headed,” Ayers says. Whenever a new software feature idea arises, it’s given a litmus test against two objectives: does it get the patient in and out quickly, and does it maximize the efficiency of the doctors? Proposal is the first step in creating a new software feature. From there, the new idea will go through discovery, solution, development and validation. During the discovery phase, company leaders brainstorm about what features the new tool should employ. Once those ideas are gathered, the product enters solution phase, where prototypes are developed. At this point, only a few developers have been involved. Once the software hits development stage, its creation is divided into specific tasks, which are doled out to teams of developers. Next, the completed product must be tested and validated. A team of quality assurance and embedded testers push the tool to its limits, to make sure it won’t crash the system or break when the client uses it. Practice Velocity’s developers use a process called Scrum, part of the Agile software development method. This workflow emphasizes teamwork and prioritizes incremental production. Developers complete two-week “sprints” to complete specific tasks. The idea is to break work into short, achievable components of a working product that visibly move the team toward its goal. Practice Velocity is hiring aggressively. This spring, a job fair at the company headquarters drew more than 200 applicants, about 40 of whom were hired. Stern promises jobs are always open for experienced senior and junior software developers. These positions are fundamental to Practice Velocity’s product, but they’re far from the only role you’ll find. Support jobs include titles like business analyst, quality assurance tester and collections specialist. And, because Practice Velocity hosts its own data, the company has a robust team of 14 IT specialists who maintain servers, train clients and troubleshoot tech issues. Recruiting skilled developers is often a challenge in Rockford, where information-related jobs make up less than 1 percent of the workforce, according to the federal Bureau of Labor Statistics. Practice Velocity typically relies on hired recruiters and employee references to find skilled developers. Unfortunately, attracting them to a smaller market like Rockford has its challenges. Stern finds he’s starting to attract top executives, from around the country, who were impressed by our region’s numerous recreational activities. Ayers, for example, had been working with a division of Humana in Dallas. Rick Cochran, Practice Velocity’s chief information officer, relocated from Denver. On the other hand, those already interested in the Rockford area quickly find their way to Practice Velocity. Before the company moved to its current facility, Stern says, he was courted by the state of Wisconsin, even receiving a call from Gov. Scott Walker inviting him to relocate to Beloit. Stern says that, although it may be harder to find skilled employees here, he remains loyal to the Rockford region. In fact, he anticipates employing 300 people in the Machesney Park office by 2018. Still, he’s supplementing his team with a new office in Madison, which is ramping up with six new jobs for software developers at all levels. Practice Velocity also is adding to its business portfolio with acquisitions of companies in Arizona, Montana, Colorado, Kentucky and elsewhere. Stern emphasizes the company’s workplace. He’s seen the transformative effect that a positive, reinforcing team culture can have on his employees. Inevitably, that positive culture can filter into the greater Rockford region. This entry was posted on Wednesday, November 16th, 2016 at 12:00 pm	and is filed under Northwest Business Magazine, Top Posts. You can follow any responses to this entry through the RSS 2.0 feed. Both comments and pings are currently closed.